Density strength session design is a percentage based progression based upon 1 Repetition Maximums (1RM) to increase your Working Strength, or the ability to do multiple reps with short recovery times with near maximal effort loading. The key to the Density strength design is the percentage based progression and a repeating, 90 second countdown interval. The progression uses 5 Rounds of 4 Reps. Each round must be completed in the 90 second interval, with the remaining time as the rest. Once the 90 seconds is up, the next round immediately starts. The Density strength design uses percentages based on 1RMs to incrementally increase the load. The volume (total repetitions) and time intervals will remain the same through out the cycle for each exercise, but the weight will get heavier. We’ve completed the density progression with a wide array of total, lower, and upper body strength exercises. Most recently, we used the progression to improve our lab rats Relative Strength Assessment scores in a four week cycle, with good results. 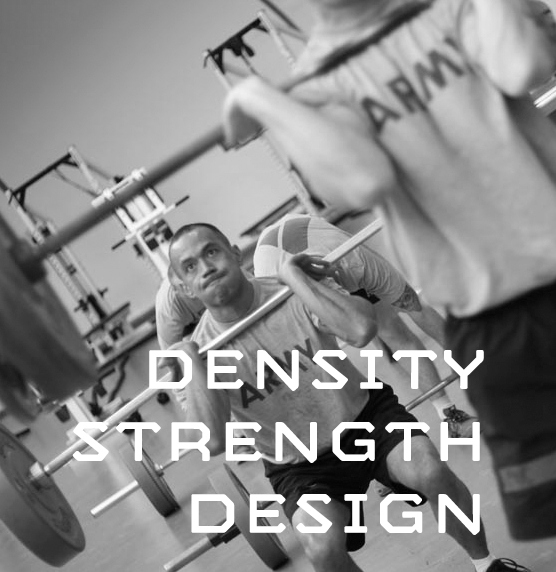 Density strength design can be easily implemented with barbell strength exercises. By the end of this course, you will be able to apply the Density strength methodology to one exercise in any cycle, or in a focused, strength cycle.